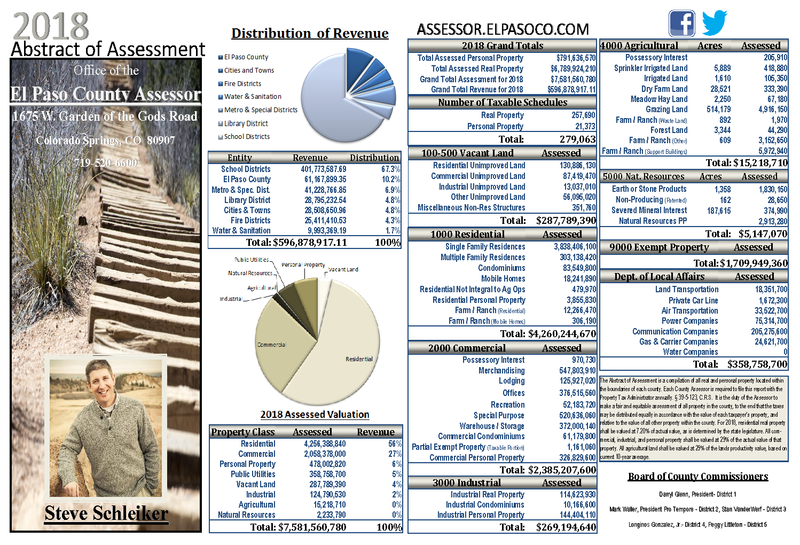 It is the duty of the Assessor to make a fair and equitable assessment of all property in El Paso County. Taxes are distributed equally in accordance with the value of each taxpayer’s property. The percent of actual value of all residential property is determined by the State Legislature. For 2019, it is set at 7.20%. All Commercial, Industrial, and Personal Property is valued at 29%. School property tax is established and levied by the District School Boards. County property tax is established and levied by the County Commissioners. City and Town property tax is established and levied by City and Town Councils. Water, Sanitation, Fire Protection, Special Improvement, Metropolitan and Miscellaneous District property taxes are established and levied by their respective boards. The Assessor’s Office has no control over tax rates! If Assessed Values Rise, Do Taxes Rise? Taxing authorities decide how much money the property tax has to raise each year, say $1 million. Assessors estimate the total assessed value of all taxable property, say $100 million. It is the responsibility of the property owner to furnish good information about your property to the Assessor. The abstract is compiled and made available to you with the compliments of the El Paso County Assessor’s Office. 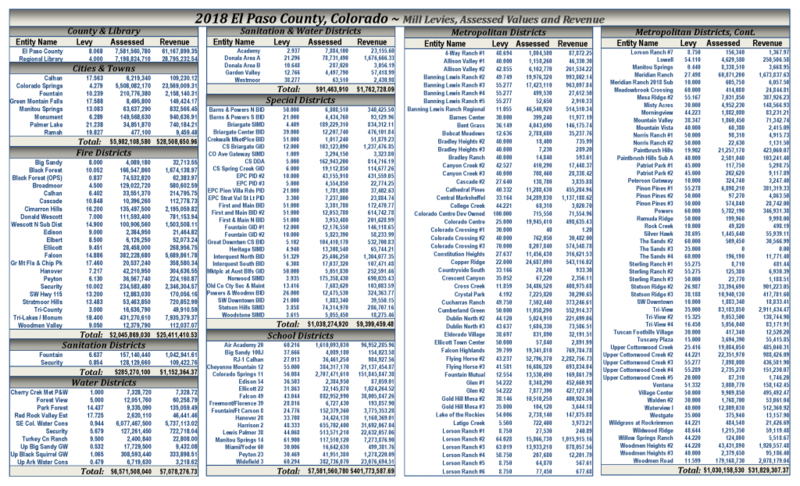 We believe you will find it accurate and informative, regarding El Paso County property valuation. Courteous answers and helpful assistance will always be provided by the Assessor’s Office to all questions and requests regarding the valuation of land, buildings, equipment, and fixtures. We encourage you to become knowledgeable about your assessments. Important notices regarding valuation and taxes due are sent by mail to property owners each year. It is the responsibility of the property owner to provide the Assessor’s Office with correct mailing addresses for these notices.